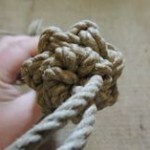 After I made my first bell rope (Making a Bell Rope) I felt very pleased with what I had produced. I made the mistake of thinking to myself, OK have made a bell rope I can now cross that off my list! A short time later I was made to think again about the making of a bell rope. 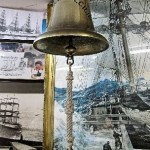 Ken Yalden recently made a bell rope for An Old Four Masted Barque (click on link to view that page). The bell rope that I made was very rigid, yet Ken was briefed that the owner of the bell wanted a flexible rope for his bell. This is what I like about being a member of the IGKT; by meeting up with other members you realise that there are many different designs and ideas to create the same thing. 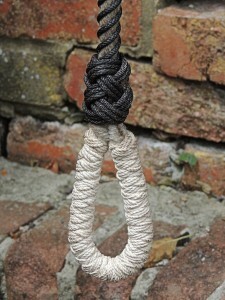 As a result of seeing Ken’s bell rope, I decided to make my own out of some Tarred cord that I had. The cord itself is synthetic, but it is also coated in tar. I have to ask why would a synthetic rope be coated with tar, as being synthetic it is already protected from the elements? What I do know is this, I find the tarred cord very difficult to work with! It really is filthy to work with, the tar makes everything very dirty (especially on a warm day). When cold the cord is very stiff, but there is less transfer of tar onto other things. 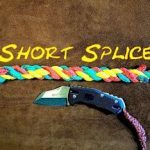 Also when tightening up any knots tightly, you can hear the cord squeak as you pull it up, then it seizes and takes a lot of force to tighten it up further. 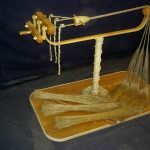 Some people have suggested that I wash the rope before use (washed in white spirit), as this will get rid of some of the tar and make the rope easier to use. 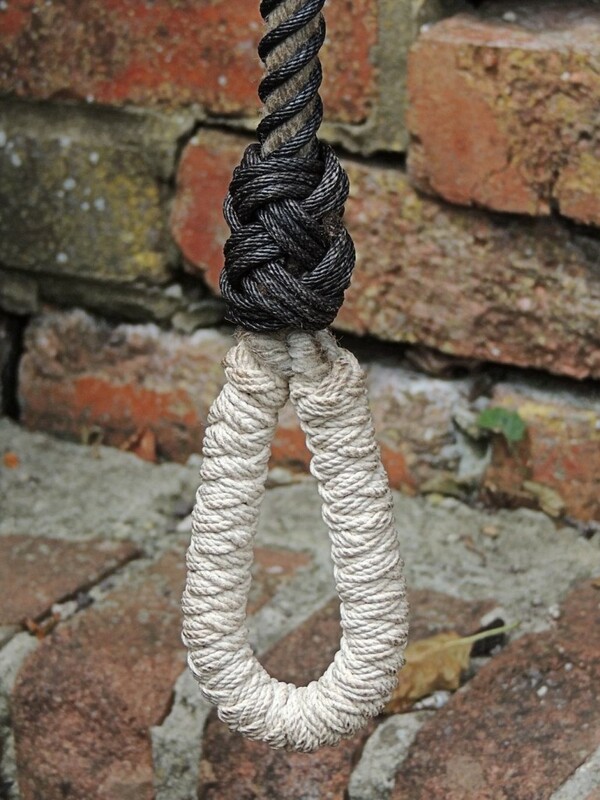 However I chose not to do this as I wanted the bell rope to show more wear of time, I figured that each time the bell is used it would wear some of the tar off. 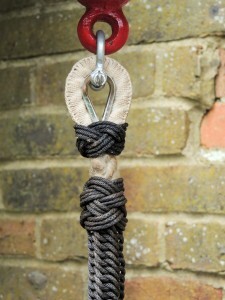 So over time some of the rope would remain very black whilst the rest would lighten with use. I had a fairly thick length of natural rope lying around, so I decided to use that as my core. I placed an eye splice at both ends and in the top splice I inserted a hard eye. I used some cotton cord Cockscombing to decorate the top eye, this was then closed off with a 4 x 3 lead Turks Head. This was also when I learned how difficult it is to stop the tar from making the white look dirty. I think if I did it again I would cover the white with a protective removable layer. I then got three lengths of tarred cord to Worm around the rope to give it a nice spiral pattern. 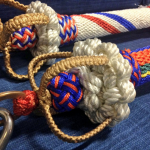 For the main handle of the rope I decided to do some continuous crowning, and then the top an bottom of the handle was finished with 3×5 Turks Head. The bottom look was finished with a 2x Many leads (enough to cover the whole loop) Turks Head. Finally the top of this was finished with another 3×5 lead Turks Head. Normally doing this sort of work would not take too long, but I had to take days and days off because the tarred rope was ripping my fingers to shreds!! To view the pictures full size, just click on them. I can answer why they tar synthectic rope, french fishermen found that UVs were bashing up their fishing lines, so they get the durability of modern lines protected by the age old method of tar to keep the sun out.